Engineered to Eject Belt Clips Quickly! The Camlock buckle is fully CNC-machined for precision quality from aircraft billet aluminum. Hardened steel tumblers lock the stainless steel belt and harness tabs into the Camlock buckle with a quick snap. Egress is just as simple, one flip of the Camlock lever arm and you're out! The shoulder and lap belts are made of standard 3-inch military spec webbing. The belt adjuster mechanisms include anti-slip spring as standard issue so you stay right where you are. 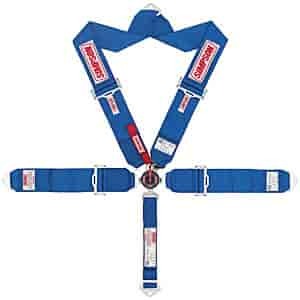 This is Simpson's latest design in racing harness systems for maximum reliability at a very affordable price. Note: ''Pull-Up Lap Belt Adjusters'' and ''Pull-Down Lap Belt Adjusters'' indicate the direction that tightens the lap belt adjusters. For example, a ''Pull-Up Lap Belt Adjuster'' is always the best choice in a Dragster. It is much easier, and safer, to tighten your belts in an upward motion (towards the latch) rather than a downward motion (away from the latch) because of the limited space.